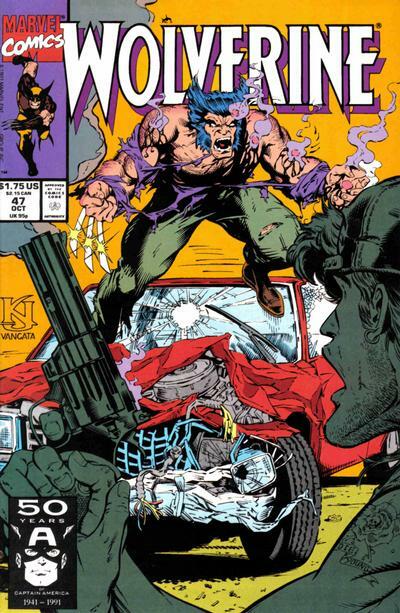 This issue begins with Wolverine picking up his motorcycle where he left it, outside the World Trade Center, in issue #40. The cop trying to ticket him says the big is registered to "NFN Logan", with NFN standing for "No First Name". 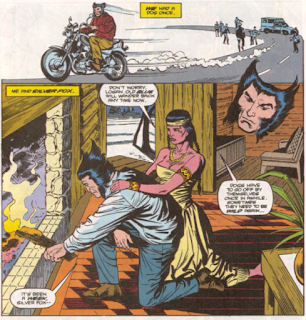 Wolverine flashes back to his time with Silver Fox, in which their dog became rapid but Wolverine was unable to put him down, though I have no idea if the upcoming stories involving altered and implanted memories will render this particular memory a fiction. Otherwise, this is a pretty straight-forward fill-in story, featuring a bunch of characters we'll never see again. Art comes from Gerald Decaire, whose work and name I don't recognize. In the process of picking up his bike, Wolverine provides a recap of recent events which, when stated matter-of-factly, are rather humorous. Uncanny X-Men #281: new artist, new team, new villains. X-Force #3: new team member, classic X-baddie, guest appearance by Spider-Man. X-Factor #71: new writer, new team, new direction. X-Men #1: new series, the best-selling comic of all time. Excalibur #42: the return of Alan Davis and respectability. Wolverine #47: Wolverine fights a one-off crackhead, doesn't shoot dogs. Clearly, Wolverine got the short-end of the stick when it came to the October 1991-dated X-books, running a one-off fill-in story while something of significance happens in every single one of the other series. It's a shame that the story which begins next issue, a deep dive into Wolverine's past, couldn't have been started a month early (presumably, it was timed such that the finale could land in the double-sized 50th issue). Technically, this isn't a pure fill-in (like the telepathic fetus story by David & Stroman in issue #44), as Hama is still on hand to write it, it references recent events in its opening pages, and features a flashback to Wolverine's time with Silver Fox (who very much becomes a thing during the upcoming historical deep dive). But it is nevertheless utterly superfluous and forgettable. All that aside though, and the poor circumstance of being published during the X-books' biggest single month to date, this isn't a terrible story. The parallels between the rapid dogs (in the present and the flashback) and the crackhead aren't exactly subtle, but Hama doesn't bludgeon us to death with them either. And there's something interesting to the idea of Wolverine being unable to put down the rapid dog and the crackhead, with the twist that the two kids almost killed by the crackhead were the cop who killed the dog's kids being reasonably surprising. This is hardly high art, and it certainly pales in comparison to the goings-on in the other books, but as a one-off fill-in, this series has seen worse. Next week: Spider-Man #15, Spider-Man #16, and Wolverine: Rahne of Terra. Maybe they told Hama to take it easy this month, among all the other stuff the kids got five X-Men #1s to buy. I enjoyed immensely of the scene at WTC, though I was kind of expecting: "Maybe I don't wanna ticket you. Maybe I wanna put you in jail." But, shouldn't there be a three days long hostage situation going on there? Like the rest of issues in this stretch, this takes place before X-MEN #1; if we assume X-FORCE #1 is roughly concurrent (probably just before), then Black Tom's WTC bombing can reasonably be placed right after this. I bought this issue that month as well and to be frank I had completely forgotten about until I saw the cover here. I do remember the handle bars in the grill vividly but that's about it. Needless to say, I thought this was representative of a typical Wolverine issue and since it bored 9 year old me, I stayed away from the series for a long time. I wonder if this issue was more relaxed than the other titles being published on purpose or if it just happened that way by accident? If nothing else, it is a nice breather before things really pick up next issue. And if nothing else, having a flashback with Silverfox is a nice reminder of her and Wolverine's "history" up till now, before they dive back into things. 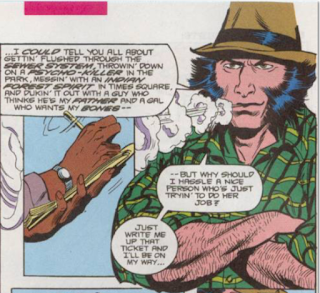 If nothing else, any newer readers might now be aware that Wolverine was in a relationship with someone called Silverfox, as opposed to wondering who Silverfox was and why she matters had we jumped right into the Weapon X story. Who did the cover? It certainly has an Art Adams feel, even if the signature says it isn't him. I'm getting quite convinced that they had to use this story at this particular point. The next issues will be tight package and the dog memory gets referenced in it so it needs to be put out there before if they're gonna at all. I'm starting to think this issue was a pre-planned fill-in to be put out after #40 at some point (maybe when Silvesti wouldn't manage the twice a month shipping schelude) so that they can pace the double-sided finale into #50, but the moment never came. Or maybe this issue didn't make it in time so it could be used for #44, and they had to go with the PAD one that was ready a couple of issues early. Or they couldn't get anyone to draw a pin-up of Wolverine seeing a dog in the Central Park for the framing device. Wolverine actually verbally checks the "need to run free" in #43 in a panel that very much reminiscens of the pin-uppy first page in #44, but then he goes to think about a ocean cruise he took upon gazing an unseen pond on that one instead. The “KJ” is Kirk Jarvinen; Brad Vancata inked — a pairing later seen on Peter David’s Aquaman: Time and Tide at DC. Good point on the reintroduction of Silver Fox - I hadn't considered that. Could be this was designed as a breather relative to the other titles, but at the same time, when has Marvel ever intentionally let up the gas, sales-wise? I did assume that stood for “No First Name” but would like to think it’s an abbreviation of what Logan gives to whomever’s persistent in asking and the “F” stands for something else. Me neither. I always feel bad dinging somebody who got a professional break in comics and especially someone who clearly puts in the work drawing street clothes and houses and vehicles but, man, Decaire’s perspective isn’t great and his people are ugly and inconsistent. I don’t know if this is was so negligible, or the source so bygone, that you missed it or was so obvious you didn’t bother remarking on it, but the cop’s kids’ dog is named Sandy and goes “Arf!” like the title character’s dog Sandy famously did in Little Orphan Annie. I missed the Sandy reference - now that you mention it, it's of course obvious, but it flew past me when I was reading the issue. Larry Hama has mentioned somewhere about his own dog being killed .... I wonder if that had happened recently when he wrote this issue?